Welcome to day 15 of 30 Days to a Food Revolution. Our guest blogger today is Naomi Devlin of Straight Into Bed Cakefree and Dried. 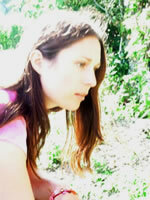 Naomi is a homeopath and nutritionist, living and working in Bridport, Dorset. She discovered that she was celiac eight years ago after she had her son Finley and just couldn’t recover. From there it was a long process of experimenting and tweaking to find the food that her body would thrive on. Using a combination of The Specific Carbohydrate Diet, Blood Type Diet and Metabolic Typing she gradually cut out all grains, pulses, sugar, all processed food and as many foods that were not native to Europe or grown in England. What she found along the way was that there’s nothing to rival good seasonal produce! She blogs about life as a foodie, mother and country bumpkin. Gordon Gekko once said, ‘Lunch is for wimps!’, in a beautiful illustration of how many people treat their lunch. Lunch can be seen as a nuisance, something to be wolfed down at your desk, grabbed from a take-away stand, eaten in a handy two-second snack-bar format or even avoided altogether. Yet this approach, (often following a similarly hurried breakfast) can lead to a host of problems, from low blood sugar being the major effect, to over emphasising carbohydrates, not chewing for digestion, low vegetable consumption and lack of essential fats. A meal is a meal, whenever it is eaten and deserves the proper care and respect – as you yourself deserve these things. By making time for your lunch and eating something that qualifies as ‘real’ food and not fast food, you will reap the benefits of better concentration, consistent energy and avoid those mid afternoon treat cravings. Stocking a lunchbox can seem like a relentless chore if you don’t do a little advance prep, which is why so many people reach for the trusty sandwich as a quick, easy to prepare and portable lunch. But for many people a sandwich has the wrong proportion of carbohydrate, protein and vegetables and can lead to a mid afternoon energy slump, sweet cravings or bloating (although for some it’s perfect and they should carry on as they are!). For coeliacs, eating gluten free bread at lunch can unbalance blood sugar because it is often made from very refined, high glycaemic index grains. To avoid this, choose bread that is enriched with egg and made from low GI grains such as buckwheat, quinoa, teff and sorghum or high in ground-nuts. 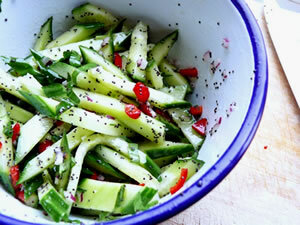 Fill it with a source of protein and accompany it with a nice big salad or some crudités. You’ll probably need to make a bread like this yourself, so make two or three loafs, slice and open freeze them so that you can grab them straight from the freezer in the morning, make up your sandwich and then they will have defrosted by the time you need to eat. No stale bread! 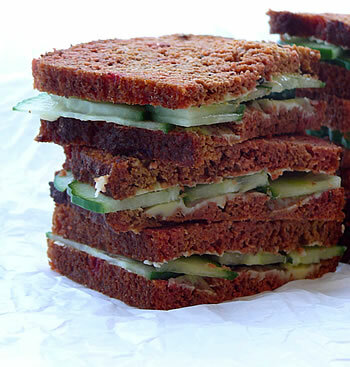 Nut bread* sandwiches with cheese, salad, crudités and a fig sweet*. Tuna mayonnaise with red onion, gem lettuce, crudités and a marzipan pinwheel*. Brown rice salad with fresh basil, gluten free sausage, watercress and cucumber, raw carrot sticks. Brown rice salad with feta, watercress, olives, asparagus, red onion and cucumber sticks. Thai fishcakes with yogurt and cucumber and romaine lettuce, square of 90% cocoa content chocolate. Thinly sliced roast beef and carrotslaw* (roll the slaw up in the beef). Egg crepe rolls* filled with tamari and ginger carrot shreds and king prawns, pear leather* and walnuts. Pea and basil pikelets*, cheddar cheese and leaves. Courgette Frittata*, walnut, feta and spinach salad. Pea and basil* or squash and caramelised onion soup*, drop scones or a cheese sandwich. Gem lettuce with smoked salmon and mayonnaise or feta, paprika almonds and crudités. *You can find all the starred recipes in the sidebar on my blog . Spend a little time in advance so that you have the right ingredients – some brown rice, a roast chicken, some roast beef, frozen (sustainably farmed) prawns, eggs, leaves, and throwing together something in the morning (or the night before) will be a breeze. Your body will thank you and you will avoid spending money on convenience food, so that you can spend it on wonderful produce instead. As a final aside – although Tupperware is a very convenient invention, if you use it every day then a third of your food has been in prolonged contact with plastic. Plastic contains hormone disrupters that can interfere with the body’s metabolism – especially important for growing children. 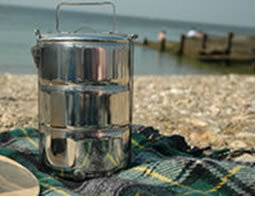 Invest in a stainless steel Tiffin Tin that will last for years – far longer than the Tupperware will! Let me know what you put in a healthy lunchbox in the comments – hopefully we can inspire each other to eat well even when we are pushed for time. 1. 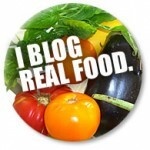 Leave a comment on this blog on as many of the 30 guest food bloggers as you like. Each comment is an entry. 2. Sign up for The W.H.O.L.E. Gang newsletter. 3. Visit that guest blogger’s site and leave a comment there too. Lunch is always a challenge. You have some good idea. Thanks! A wonderful post, Naomi. You always inspire me! I see some wonderful ideas in your lunch listing. They sound so appealing that I wish I had some of those for my breakfast. 🙂 Love that cucumber sandwich photo! A good balance of protein, fruits, and veggies, and even chocolate, is the message that comes through to me. Thanks so much for the reminders/guidance. I tend to alternate between leftovers and sort of hodge podge lunches of various fresh ingredients. There's room for improvement though and I'll use your listing to help come up with some new lunches. And, those Tiffins seem like the coolest. Do you recommend the lunch bowls for that purpose? If you were buying just one tiffin tin set to start, which one would you buy? I have the worst time packing lunch for my son, he is a light eater and half the lunch comes home after school. Thanks for the ideas. Lunch is one of the hardest meals for us since I don't put a lot of thought into it. Thanks for the ideas. I am slowly trying to get rid of the tupperware also but I think I will start replacing quicker than I have been. Fantastic Naomi! Thank you so much for discussing the effect of food, especially lunch food, on our bodies. Excellent. We just got a couple of those stainless lunch boxes that stack at a store here called, World Market. They're great! Excellant post and great advice. I so often forget to eat lunch at it sets me up for a difficult night. I love this post of yours, Naomi. Brilliant, beautiful and thoughtful. Excellent guidelines. Shirley's right, you always inspire me, as well! I'm hungry right now, must go make myself a lovely lunch. You've certainly given me some good ideas. Thanks for all the lunch ideas! I don't need lunch every day, but I still run out of ideas quickly. I find it frustrating that many people do not spend the same time and preparation on lunch as they would on dinner. They go for the quick fix, something that will satisfy their hunger without a thought to nutrients. My co-workers generally grab a burger or a slice of pizza, or they bring pre-packaged food, like Mr. Noodles or a frozen tv dinner, that they can microwave. Only rarely do I see someone bring in left-overs from the night before, like spaghetti or pancakes. It's become the running joke to ask me what I brought for lunch, because they think I eat 'weird' food. I don't think it's unreasonable to spend 15-30 minutes preparing a healthy lunch each morning (even quicker when you have left overs from last night's dinner needing to be eaten). This morning, I made a quick applesauce, with some oatmeal & honey thrown in, took some fresh blueberries, and a container of left over spaghetti squash with a mushroom & leek cream sauce. Yesterday I threw together some fresh spring rolls in the morning (using rice paper wrappers and rice vermicelli noodles, both of which only take minutes to soak.) I added romaine lettuce, spring onion, carrot, cucumber, and crab meat to them. I brought a bottle of Vietnamese nuac cham sauce to dip them in. I always keep little containers of nuts or dates to snack on. I bring skim or soy milk every day to make a chai latte, and I keep the tea bags in my desk drawer. I love your idea of the tiffin box instead of tupperware. I need to start getting away from plastics, so thank you for the suggestion! Yes, lunch is often the most overlooked meal for me. I must admit that I rely on leftovers more often than not. Healthy leftovers, none the less, but still, it would be lovely to stop in the middle of the day and take the time to create a healthy lunch on the spot. Your post is a reminder that we owe it to ourselves, for the sake of our physical, emotional, and spiritual health, to stop and smell the roses, or in this case, make something for lunch that is nutritious and delicious. Thanks for the tip. And I am a huge fan of your blog. I just perused your pitta bread recipes and they all sound fantastic. Can't wait to try them! Some AMAZING lunch ideas! I definitely need to rethink my lunch routine (usually either leftovers from the day before or a salad, or maybe some cut up veggies alongside GF whole grain crackers and canned sardines). one of our favorite things for lunch is your sweet potato pitta bread with hummus and veggies. thanks for the great ideas and delicious recipes. I love that you point out that a healthy gluten-free diet needs to be different…it can't mimic the high-carb standard American diet and still be healthy. When the only thing I changed was cutting out gluten (and still eating lots of corn, rice and potato flour), I gained weight and still wasn't healthy. I agree that lower glycemic index grains like buckwheat are a better choice. Grain-free recipes are a great option, too! I work from home and prepare my own lunch each day. My lunch usually consists of leftovers, or sauteed veggies and meat over a bed of lettuce. Spring rolls filled with veggies and leftover meat make a great lunch! Another great lunch option (that is portable) is making pancakes or waffles out of grated zucchini, a little bit of flour (a combination of buckwheat, tapioca flour and flax meal), baking powder, eggs and almond milk. I season it and add diced onions and peppers and it can be topped with butter, salsa or hummus. thanks for your post, I really want to move the plastic tupperware out of the house and this is a great reminder/inspiration that it needs to be done! for lunches, we like to make our three-year old rolls with sushi wrappers, filled with things like avocados, black beans, meat, veggies, etc. or fritters with teff or sorghum flour, ground meat, and chopped veggies and dipped in applesauce. So glad to learn of your blog! I look forward to checking out your recipes. I have always been a good lunch-eater, better than breakfast. And you're right — if you bring lunch to work that takes more than 3 minutes to prepare, people think you are weird! Your lunch ideas are awesome.